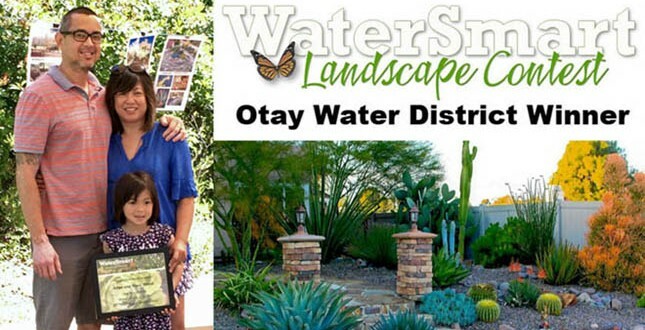 As part of the 2017 San Diego Countywide WaterSmart Landscape Contest, formerly known as the California-Friendly Landscape Contest, the Otay Water District recently announced its “Best in District” WaterSmart landscape winners, Allan and Rose Wood from Bonita, California. The Wood’s landscape serves as a water-efficient role model, incorporating appropriate plant selection, creative design, appropriate maintenance, and efficient irrigation methods. In the fall of 2013, the Woods decided to relandscape their high water-use tropical garden. They removed the grass along with about half a dozen Queen Palms and clusters of King Palms from their front yard. With the help of a hired landscaping contractor, the Woods designed a natural desert-scape theme with vibrant, colorful water-wise plants. 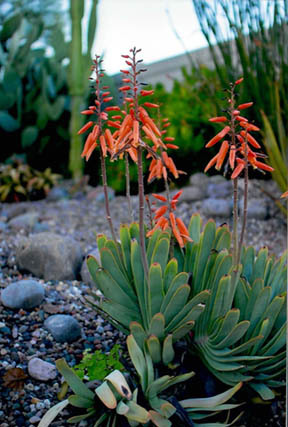 Plants varied from agave to cacti to Palo Verde trees and other California-friendly plants that thrive in the San Diego County’s Mediterranean climate. In addition to their non-thirsty and low-maintenance plant palette, the Woods installed a weed barrier, gravel, and boulders to substitute the existing grass. According to the Woods, they replaced the sprinkler system with a drip system, which is used to water the plants once a month for 15 minutes in the summer and during unscheduled times in the winter depending on weather conditions. District staff recognized the Woods at a special awards ceremony on May 21 at the Water Conservation Garden. They received a certificate of recognition, a $250 gift card to Walter Andersen Nursery, and a goodie bag filled with a variety of water-related promotional items. To learn more about the annual WaterSmart Landscape Contest, visit landscapecontest.com. 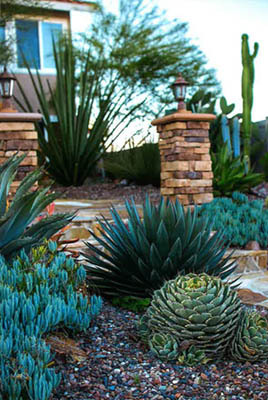 For resources on water-efficient rebates and landscape designs, visit otaywater.gov/conservation.